Cloudy and cold (officially 23–31 F) but, thankfully, winds were light for the 2018 Christmas Bird Count on Saturday, December 29th. With a few exceptions, overall numbers were down and the 97 species on the list is a bit off pace for the past few years, but there was still lots to see and enjoy on the CBC, including 11,675 individual birds.. We recorded the Stillwater Count’s first White-winged Doves – 22 of them! These might represent the true leading edge of that species’ expansion northward. We also had new high counts for Ring-necked Duck (296), Double-crested Cormorant (307), and Greater Roadrunner (6), with 6 Eastern Phoebes tying the high count record that that species. Here are some photos to get us going – the grainy, distant, and out-of-focus ones are from Tim O’Connell; Jim Cowley supplied the good ones! Tim likes to befriend livestock when he’s in the field! We are grateful to 25 volunteers who bundled up and trundled out to spend the day afield! Together we had 10 parties investing 62.5 hours in searching for birds, with 239 miles driven and 17.5 walked. Thank you for your time and effort Jessica Torres, Deb Hirt, James Kowaleski, Ryan Shannon, Ashley Love, Eric Duell, Elaine Stebler, Damona Doye, Iris McPherson, Scott Loss, Erin Latham, David Latham, Doug Latham, Janet Latham, Lori Green, Jim Shaw, Ray Moranz, Helena Moranz, Les Imboden, Susie Taylor, Jim Cowley, Suze Cowley, Corey Riding, Ron Huebner, and Tim O’Connell. Enjoy these photos by Jessica Torres! Thanks for your interest in the Christmas Bird Count. Twenty-seven hearty souls braved frigid north winds, dull skies, and freezing fog to participate in the 118th annual Audubon Christmas Bird Count on 30 December 2017. It really was miserable outside, but as uncomfortable as we were, focusing on those birds out there just trying to survive kept us going. In 64.5 hours, those 27 volunteers walked 22.2 miles and drove 325.3 miles in their quest to count at least 16,893 individuals of 101 species. Many thanks to our searchers: Tim O’Connell, Craig Davis, Ray Moranz, Andrew Moranz, Abbey Ramirez, Cassandra Rodenbaugh, Les Imboden, John Couch, Corey Riding, Eric Duell, Jonathan Harris, Ashley Knoch, Ashley Love, Ryan Shannon, Caitlin Laughlin, Luci Wilson, Damona Doye, Elaine Stebler, Kent Andersson, Jen Grindstaff, Dave Latham, Doug Latham, Janet Latham, Erin Latham, Jessica Torres, Deb Hirt, and Richard Burnett. Congratulations – and thanks for sharing – Jessica Torres who came back from the zone west of Lake McMurtry with these extraordinary photos! The 117th annual Audubon Christmas Bird Counts have been completed. The Sooner Lake CBC was conducted on Monday, Dec. 19 and the Stillwater CBC on Wednesday, Dec. 21. Morning dawned pink, purple, and cold at Lake Carl Blackwell. Damona Doye, Elaine Stebler, John McQuaig, Austin Jenkins, Holly Ewing, Scott Loss, Les Imboden, Leslie Miller, Freddy Miller, Helen Jordan, Lelia Heading, Kent Andersson, Linnea Andersson, Jennifer Grindstaff, Caitlin Laughlin, Mike Yough, Corey Riding, Jane Cronin, Eric Duell, Cyndi Park, and Jonathan Harris. The seven(!) Barrow’s Goldeneyes reported from Lake McMurtry win the rarity prize for this count, but without photos they’re likely to be omitted in the records review process. We also had some great “count week” birds (those observed within 3 days before or after the count, but not on the count day itself): Brown Pelican, Lesser Black-backed Gull, and Red-breasted Merganser (all from Boomer Lake). Sean Smart rewarded for his day in the field with a handful of lifers and a few moments to soak in the peace and quiet at the Lake Carl Blackwell grotto. Photo by Tim O’Connell. Best. Persimmons. Ever. Photo by Tim O’Connell. There’s a nice buck around here somewhere. Photo by Tim O’Connell. Stillwater’s Audubon Christmas Bird Count took place on Saturday, Dec. 19th 2015, with 31 members and friends spending a day in the field counting local birds. The local count, held each year since 1947, represents the longest-running census of wintering birds in Stillwater and the surrounding area. Within the 177 square mile count area, birders tallied more than 18,600 birds of at least 98 different species. We are grateful to Jim Ownby for compiling our local data! It was a good day for birding, with moderate temperatures (at least once the sun came up!) and little wind. This year we’ve seen few “irruptive” species, birds who occasionally appear from the north, such as Red-breasted Nuthatch and Pine Siskin. Neither was tallied on the count. A Downy Woodpecker always cheers you up on a crisp December day! The complete unofficial tally of birds follows. To learn more about any of these species, check out Audubon’s free online Guide to North American Birds. You can find photos, range maps, recorded calls, and detailed natural history information for each of the species on our list. For example, check out the entry for Gadwall. Birders who participated in the count were: Kent Andersson, Cody Barnes, Talia Branham, Anne Collins, John Couch, Damona Doye, Eric Duell, Alin Gonzalez, Jennifer Grindstaff, Lelia Heading, Alex James, Helen Jordan, Caitlin Laughlin, Britton Lilly, Scott Loss, Bob McCormick, Peggy McCormick, Cindy McGill, Noah McGill, Iris McPherson, Joyce Meyer, Leslie Miller, Helena Moranz, Ray Moranz, Arpad Nyari, Tim O’Connell, Charlotte Ownby, Jim Ownby, Monica Papes, John Polo, and Elaine Stebler. 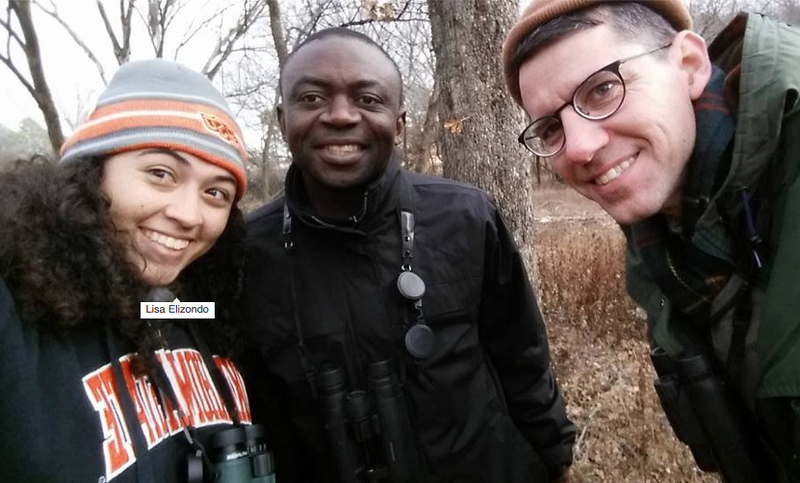 Members and friends of Payne County Audubon Society participated in the 115th annual National Audubon Society Christmas Bird Count on December 20, 2014. The local count, held each year since 1947, represents the longest-running census of wintering birds in Stillwater and surrounding Payne County. Within the 177 square mile count area, birders tallied more than 15,000 birds of 101 different species. It was a fine day for birding, with cool temperatures and little wind. The only true rarity was a Lewis’s Woodpecker, normally found in the Rocky Mountains, that has been seen at Lake Carl Blackwell since at least Nov. 18th. Dark-eyed Juncos, the commonest wintering sparrow in Payne County, were not as abundant as in most years. 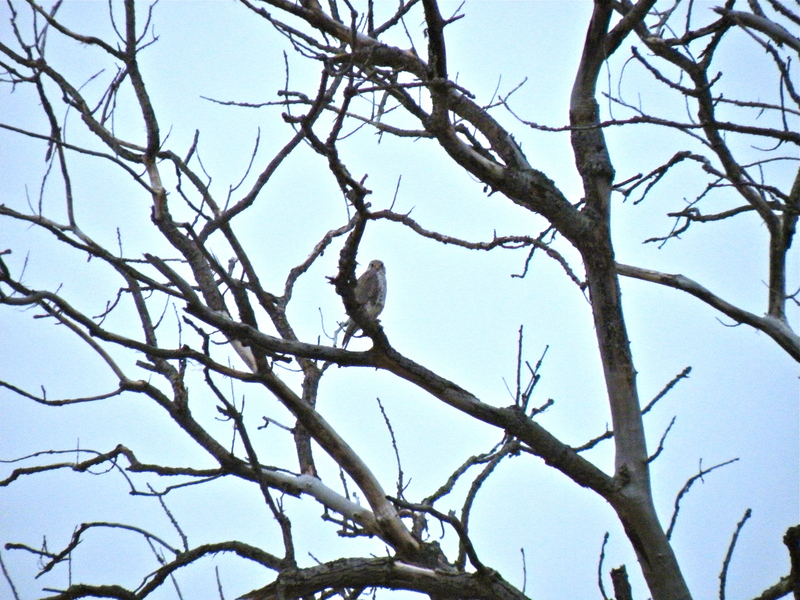 Prairie Falcon in the “Lewis’s Woodpecker” tree at Lake Carl Blackwell, 20 Dec. 2014. Photo by Tim O’Connell. Since the first count was held in 1947, a substantial part of the count area has been converted from prairie grassland to residential areas. More prairie has been lost to invasive red cedar. We now see fewer birds that winter on the prairie and in riparian areas, such as Eastern Meadowlarks, American Tree Sparrows, Bewick’s Wrens, and Northern Bobwhite. The changes in habitat have benefited species such as Red-shouldered Hawks, American Robins, and Cedar Waxwings, as well as non-native European Starlings and House Sparrows. Birders who participated in the count were: Kent Andersson, Fidel Atuo, Laurie Clemens, Jim Cowley, Suzanne Cowley, Damona Doye, Eric Duell, Elisa Elizondo, Jennifer Grindstaff, Lelia Heading, Deb Hirt, Les Imboden, Alex James, Helen Jordan, Caitlin Laughlin, Bob McCormick, Peggy McCormick, Freddy Miller, Leslie Miller, Andrew Moranz, Helena Moranz, Ray Moranz, Arpad Nyari, Tim O’Connell, Jim Ownby, Monica Papes, John Polo, Thea Pratt, Natalia Santos, Bob Schlottmann, Elaine Stebler, Sue Taylor, and Susan Walker. Lisa, Fidel, and Tim take a selfie break at Lake Carl Blackwell. In 2019, the Audubon Christmas Bird Count will be 120 years old! The Stillwater Count will take place sometime between 15–30 December, 2019. We’ll select the date sometime in November 2019, with a tentatively planned CBC planning meeting on Thursday, 5 December 2019. NOTE: It’s very important that we capture some information from you in addition to your bird counts, especially if you do any portion of the count on your own. We will need to report how many people were in your party, their first and last names, how many hours you spent looking for birds, and how many miles you drove and/or walked over the course of the day. This information is necessary to calculate the abundance of species detected as a function of the total effort invested. Walking miles are always difficult to estimate, but if you take a moment to jot down the time and your vehicle mileage before you head out, that will help a lot! DO join us for one or both counts. DON’T think you’re not good enough at counting birds to help. The CBC is a great way to get started in birding! Thanks, have fun, be safe, and good birding! The brainchild of ornithologist Frank Chapman at the American Museum of Natural History in 1900, the National Audubon Society’s annual Christmas Bird Count was among the first true citizen science endeavors. Today, with more than a century of data under our collective belt, the CBC provides some of the best data on long-term population trends for wintering birds in the US and Canada. For species that breed well north of the reach of the Breeding Bird Survey, the CBC provides our only systematic sample of populations. Listen to the late, great Chan Robbins – founder of the North American Breeding Bird Survey – explaining the origin and value of the Christmas Bird Count. Chan should know, as he participated in more than 400 of them! Our Stillwater CBC was founded in 1947 by husband-and-wife ornithologists Fred and Marguerite Baumgartner. Their efforts, combined with the dedicated leadership and service of all the members and friends of the Payne County Audubon Society, have helped build a remarkable database that tracks bird populations and, by extension, habitat changes in our region. The grassland-dependent Loggerhead Shrike has declined dramatically, especially within the last 15 years. In contrast, the urban-adapted Eurasian Collared Dove has recently colonized Stillwater and is steadily increasing in abundance. This page explains a bit more about our local Christmas Bird Counts, and provides summaries of past counts. We hope you can join us for the next one in December 2019!